On November 16, 2018, Elections Canada mailed out a confirmation package to 147 NCA members. 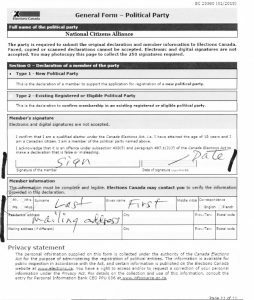 We ask these members to complete the confirmation form and mail it back to Elections Canada in the stamped addressed envelope provided. Thank you. In addition, we ask all NCA members and supporters who have not yet mailed us a declaration form to do as soon as you can, and please get any interested family member and friends to complete the form as well. The deadline to receive these declaration forms is December 20, 2018. 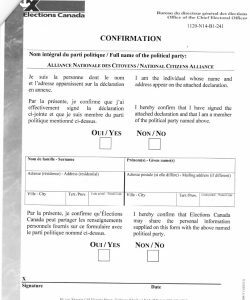 For just 1 stamp, you will contribute to the success of the National Citizens Alliance and by extension the Canadian people, and get a free non-voting NCA membership. These forms can be printed out, but we need the originally signed form. If you need any assistance please email us at info@nationalcitizensalliance.ca or call us at 1-833-822-8330. We are happy to assist you with these forms and answer any questions. Unity must be our greatest strength!